"Rediscovering the Lone Ranger Rock"
Some see the face of a masked man in the lower rock. Iverson Ranch, located just north of Hollywood and Los Angeles and nestled among the rocky cliffs and hills of Chatsworth, became a center of western filming in the period of the 1930's through 50's. It was, of course, one of the sites for filming The Lone Ranger television series. 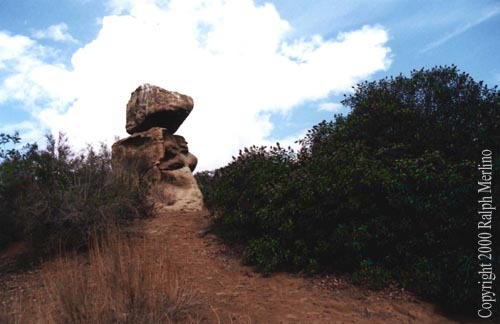 Corriganville, which came to be known as Lone Ranger Ranch in the credits, and now remains as a cement slab or two, lies not more than a few miles away in the same general area. Joe and Iva Iverson, whose story is worth an article itself, hosted so many of the film greats that now their ranch contains its own version of the Hollywood walk of fame. Those associated with the ranch began the tradition of having the cast members set their feet and their autographs in cement when they finished filming a movie or serial. So today, one finds the footprints of such greats as Ronald Reagan, Rin Tin Tin, John Wayne, Roger Rogers and Dale Evans. 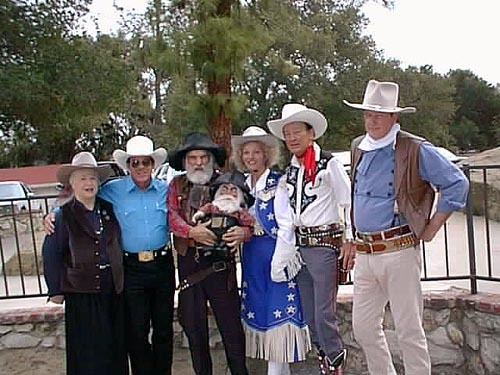 Saturday, October 21, 2000, Iverson Ranch hosted its annual "Wild, Wild West Days," open to the public with donations going to the Roy Rogers and Dale Evans Children's Fund. As can be seen from Tony Montesione's photography, many of the old timers and their look alikes were present. There was more cement poured, and more stuntmen and western actors' names and prints were immortalized into the cement. Nikki Pelley (Dale Evans), Bill Nolt (Roy Rogers) and Ermal Williamson (John Wayne). My thanks to Jim Hollaert for the use of his great photo. 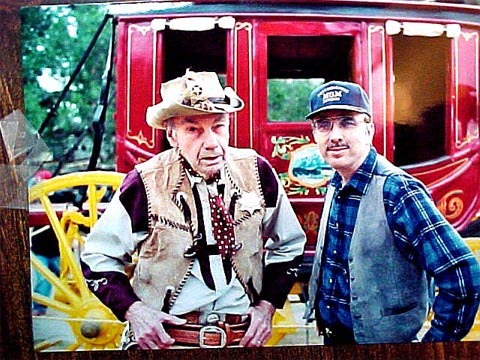 One of those photographs shows Tony with a colorful westerns actor, Bob Brown. I had heard from Tony that Bob knew Fran Striker, who wrote the original Lone Ranger story in the 1930's. I interviewed Bob, who is now 90, and he told me that back in 1948 Fran Striker called him from Detroit one day and told him they had his photo and wanted him to try out for the part of the Lone Ranger in a pilot for a new television series. Bob told Fran he was not interested because of all the corrupt deals he knew about in Hollywood and because he owned his own prosperous business making western leather goods (belts, holsters, chaps, etc.) for many of the most popular westerns actors. Frank asked him to wait a minute and put Brace Beemer (the actor who played the Lone Ranger on the radio and whose deep voice we still hear on the television series) on the phone to convince him to try out. He declined even the second invitation and now lives to tell of the day he declined to become the Lone Ranger. It just makes us reflect on how things would have been different if Bob had taken the role instead of Clayton. To what extent was the Wrather Corporation later incorrect when it told the public during the "prohibition period" in the 1980's that it was the role and concept, not the actor, which was more important? Bob Brown with photographer, Tony Montesione. Tony and his friend Ralph Merlino (both of whom are photographers with decades of experience working around the motion film industry) volunteered to hike with me over to the Lone Ranger Rock, which was, of course, one of my main reasons for attending the event. Ralph commented that he could help us identify many famous places up there because he was out there in the 50's while they were filming westerns. This matter of "identifying" the rock becomes an issue when you see the condominium developments which surround this area directly down the street from the entrance to Iverson Ranch. Then there are the Oak trees which have grown up until they partially obscure the scenes the way we remember them from the TV episodes. Like so many of us who try to return home to our childhood home sites, schools, favorite cafes, or drive-in movies, things change so much they don't even look the same anymore! I felt I was in good hands, though, with two such experienced "guides." which we mistakenly thought was the right rock. So, as we walked around behind the condos, I got out my prints of the rock from Mary Spooner's web site (www.outofthenight.com/cmrock.html) where there is a comparison of the famous scene of Clayton rearing Silver from the opening scene of each episode with her and her family at the rock at this time of year in October 1997. I assumed my guides would find these prints unnecessary, but I wanted some orientation of what I was looking for myself. What we originally thought was the Lone Ranger Rock, turned out later to be the site known as the Garden of the Gods. 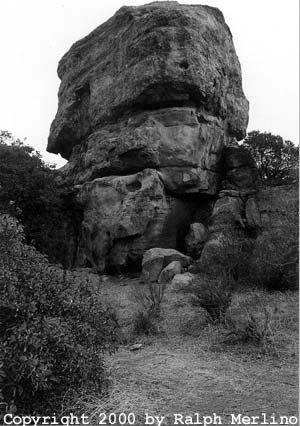 The larger of the two facing rocks and is also known as Indian Head Rock, and isn't the only formation around this general vicinity. Situated within a quarter of a mile of it are the "cliffs" from "The Perils of Nyoka" serial, and, it turns out, the location of many of William S. Hart's films. Part of my guides' challenge, therefore, was to walk around to the angle where you see the trail on which Clayton rode up with that unusual jagged, beaked, and precarious rock behind him. Some of the rocks themselves lie only about 250 feet southwest from the backyards of one set the condos, and really it is no "hike" but a short, easy walk through a clear path to get there. Still, we walked up by the "Garden of the Gods" and started holding up my pictures as we walked behind and around the rock to get the angle straight. Nothing looked right for the longest time. I even resorted to taking the pictures down to a condo owner whom I had heard banging pots and pans around in the kitchen (see, the wild west really is that close to civilization today), showing them to her, and asking her which one was the Lone Ranger Rock. Talk about loss of historical memory or lack of awareness of the one feature which might determine the property value of your condo - she had no idea what in the world I was talking about. She just stared at the picture, looked up at the rock, and shrugged her shoulders. Later, Ralph sent me an article from The Los Angeles Times ("Living in the Land of the Western," August 10, 2000, E1) featuring one of the owners of those condos who really knows and appreciates the rock out his back door. Steve Latshaw, it says, has even formed a group of concerned neighbors who have patrolled the area with flashlights and walkie-talkies when gangs went up there at night and posed a threat to the historic values of the place. I contacted Steve and spoke to him about his "citizens patrol." I found he has made some movies himself at Corriganville, the site of the old Lone Ranger Ranch just a few miles away from Iverson's. Here's a great irony. Fifty years after the filming of the masked man who rode up that hill for justice, today that citizens patrol works closely with the "Rangers," a law enforcement group of the Santa Monica Mountain Conservancy, whom Steve identifies as true "Lone Rangers" in the sense that they have this vast territory to cover between Griffith Park, Molholland Drive, to the coastal mountains near the ocean at Malibu and Santa Monica. These Rangers have been greatly assisted by Steve's citizen's patrol. Together, they have brought about thirty-two arrests or citations, the last one being a fugitive. So, the historic rock continues as a site of rangers and justice. Where were my guides and their exacting human global positioning senses? It turns out they had seen so much around this area, that their memories have many events from these rocks locked into place. Ralph proved that to Tony and me. He said, "Come over here behind the Lone Ranger Rock, and I'll show you something no one else knows about or remembers." About 75 feet behind the rock we mistakenly called the Lone Ranger Rock there's a cliff which today drops down to the street leading to Iverson Ranch. But about 20 feet from the edge of the rock and partially covered by sand lies what looks like a rusted iron ring or a railroad track turned on its edge and curved in about a 20 foot semi-circle. "Few people know it," Ralph revealed, "but William S. Hart used to pitch his tent right here at night when he was filming. He would not leave the location until they actually completed the filming." So, there's more to the rock than we latter-day observers realize, and if it weren't for the oral histories walking around in the form of Tony, Ralph, and some of the Iverson staff, few would know. Tony and Ralph photographed what we thought to be the Lone Ranger Rock from various angles which you see here in their photos. But during the week to come, we would get on the phone or the email and practically shake our heads that this just wasn't right. 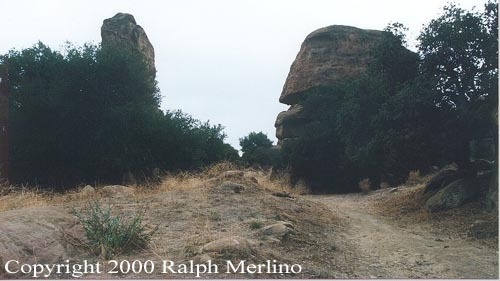 Finally, six days later, Ralph returned to the Iverson Ranch area and located Steve Latshaw to re-photograph the correct rock from the more familiar perspective of the actual Lone Ranger Rock. Ralph tells me he has come to this conclusion: On the east side of the street and only 75-100 feet off the road in back of Steve's condo is the actual Lone Ranger Rock we know from the opening scenes, but that Joe Iverson in the fifties called the first rock we visited on the west side of the street the Lone Ranger Rock (which vindicates my guides and their historical memory!). We should have realized this a week earlier because when we returned to Iverson Ranch, my wife and children exclaimed, "We've just come back from Lone Ranger Rock, " and I confidently I replied, "Sure! I didn't see you hiking up around there." "No," they smugly admonished, "we walked down the street and saw the sign which points up to the rock and saw it just like in the opening scenes from the street." So much for living guides and global positioning. Anyone now can see the rock from the street if know just where to look. But they didn't see the rest of the historical artifacts as we did. Still, a good photographer such as Ralph Merlino does not give up. He phoned me several days later and excitedly told me a friend of his, who was scanning the photo of the actual Lone Ranger Rock, claimed he saw the image of a masked man in the lower rock. He had me get the original color print out and look carefully. Especially in the original, but still discernible on the image at the lead of this article, most people can make out the two eyes, nose, and mask of a masked man! Others have asked whether we think anyone saw this during the filming in the 50's. If you look closely at the opening scene and know exactly where to look, Silver in rearing up covers this spot on the rock. Also, the camera angle is slightly different, so that the masked man image would not be that noticeable. We have decided to leave you, the reader, to your own conclusions about the meaning of Ralph's amazing discovery. I was on the phone with Clay one day and I asked him if he had a star. We were discussing the fact that Jay Silverheels had one. Clay said that he did not have one but would sure like to have one. He then said, "They will probably give me one when I am dead". I replied, " Not if I can help it". I called Clay's close friend, Jim Hoiby in Santa Barbara. I told Jim about it and he thought it was a great idea. He said he could raise the money and apparently did. However, a year or two later, I called Clay and he said Jim submitted the request but it was turned down for some reason. However, when they took his mask away (I was with him in court that day) Clay became the center of attention and people started to rally to his side. Rick Dees, the disc Jockey, took up the cause again for his star and it was Rick who made it happen. Then there's the story of Ralph's relationship with Clayton. Ralph just doesn't look old enough to have been at the rock in the 50's, so I asked him. He in fact was born in 1943. It turns out that when Ralph was 12 years old in 1955, his father moved them into a neighborhood in Canoga Park (not more than 10-15 miles south of Iverson Ranch) and north of Hollywood. His father told Ralph that the Lone Ranger lived nearby. Ralph got a job delivering newspapers to about 200 homes in his neighborhood. He'd get out around 5:00-6:00 a.m. on his bicycle to deliver papers, and often would pass this man riding a red Raleigh (English bicycle). One day, he threw a paper up on to the yard when that man was pulling into his driveway from his morning bike ride. That man was Clayton Moore. So, part of Clayton's physical regimen was not just swimming in the Olympic size pool but riding for an hour each morning. Later, when Clayton finished with the last episode in 1956 and started going on tour, he asked Ralph to mow his lawn and tend for his place while he was gone. He promised Ralph two things: "Come over and do this work each Saturday. Sally will make you lunch and then will pay you." Ralph got a sandwich and exactly one quarter for 4-6 hours work in the late fifties. He smiles when he tells you Clayton always was thrifty or frugal, shall we say. The two became lifetime friends through this boyhood acquaintance in which Clayton befriended him and even would take him for Saturday rides in his new '59 red Corvette down to the grocery store. One Christmas, seeing his talent for photography, Clayton gave Ralph a brown Kodak Hawkeye camera and thus helped launch his career as a professional Hollywood photographer. By the way, not even all this background accounted for how a teenager would be at Iverson Ranch to see the filming location and know the rock from the fifties. Ralph's father, it turns out, knew Joe Iverson, and would take Ralph out to the Ranch. So, here's this teenager whom every kid in America would have eagerly traded places with in 1956 - he gets to bring the Lone Ranger his morning paper, mow his lawn, ride in his " 'Vette," see the filming location, and yes, even gets one the of real silver bullets from his actual holster (not one of the aluminum ones given out in mass at public appearances). Thus, I concede that Ralph and Tony have the experience to show any of us both of the rocks today. and the Lone Ranger Rock! Note: A special thanks to Tony Montesione for allowing me to transform his "Ghostriders in the Sky" photo into the background used on this page and on the next page as well. Tony was inspired as he walked through the gates of Iversons. 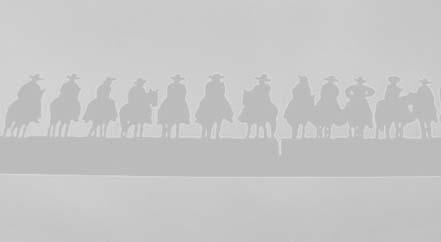 He looked up and saw what he deemed GHOST RIDERS IN THE SKY. He had to take this shot with the storm clouds forming above. The full color photo can be viewed on the next page. Click on CONTACT to send me email about this page!